This small example will show you how to run a VB Script from the PDF printer after the document is created. The principles used here are the same if you want to use it with the RunOnSuccess or RunOnError settings. For this example, I have created a small VB Script that takes a number of parameters. 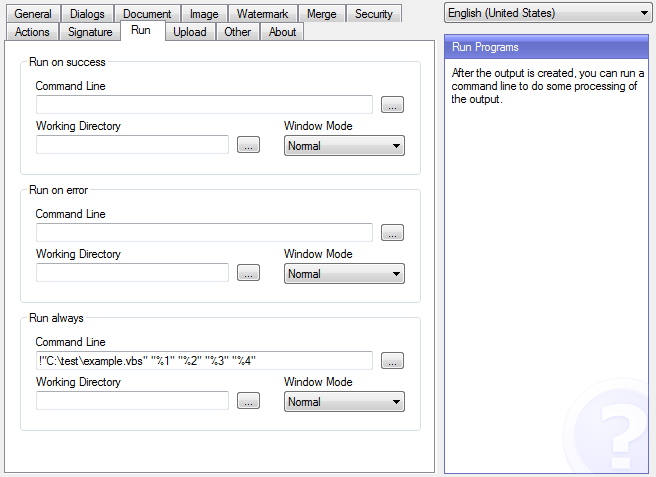 These parameters are always passed to the programs specified under AfterPrintProgram, RunOnSuccess, and RunOnError. Note that the full path of the VB Script is surrounded by quotes to make sure it works if the path contains spaces. You should also note the ! in front of the command. This will make the printer execute the command in Shell Execute mode, which is the same as if you run it using the run box found in your Windows start menu. If you leave out the ! then the printer will think the VB Script is an executable file type and fail.